On Wednesday night, I preheated the oven for Dave to make himself fish (I was having lentil pasta, of course, so didn’t need the oven for my own meal). About 10 minutes later, when he went to put his fish into the oven, he pulled out a baking sheet with two extremely burnt veggie burgers on there. He asked me what they were, and I had no idea, like I had never seen them before in my entire life. Then, a minute later, I realized, those were mine. I cooked them earlier in the day and meant to eat them for lunch. But clearly, I had not eaten them for lunch — I had left them in there and even turned off the oven, without realizing what I was doing. So what did I have for lunch that day? I know I made scrambled eggs with spinach on the stove and had an avocado, but that wouldn’t have been enough food for me and my ravenous pregnant appetite, and I meant to have the two veggie burgers with it to round out the meal. How could I have possibly NOT realized I left the cooked veggie burgers in the oven and didn’t eat them for lunch as I had planned to do? I guess I was preoccupied? This may seem silly, but I was totally concerned about this lapse in memory, as well as the lapse in my lunch, which must have been very small and clearly unmemorable. I used this backpack as my carry-on on my trip to Florida, and I’ve also been using it for all of my trips to the City lately. It’s got a convenient laptop sleeve inside, plenty of space for a change of clothes, and a front pocket perfect for my wallet, shades and keys — basically all I could ask for. Oh and the interior is red, which is super fun. 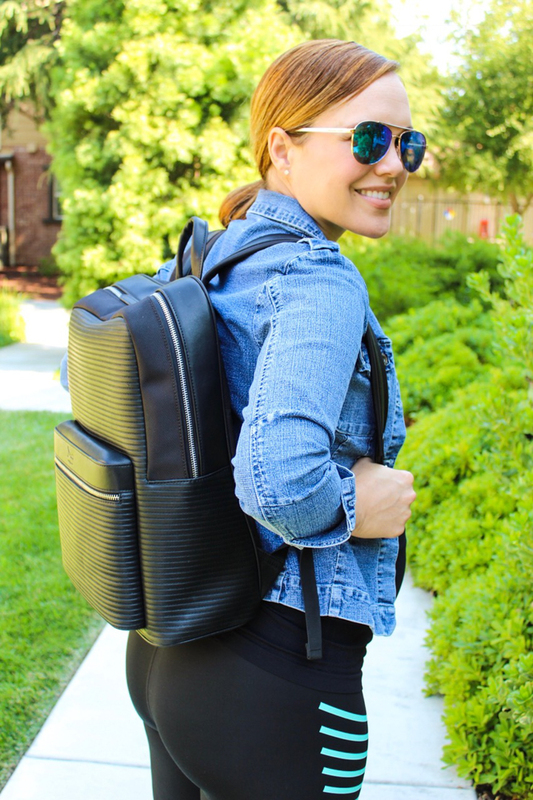 So in addition to the fact that this backpack is vegan leather (i.e. not actually leather) and looks good with those cool ribbed details, the Doshi company also gives back five percent of proceeds to organizations that help animals and the environment and is PETA approved. Love it! Check them out, if you’re in need of some vegan leather accessories. Let’s keep talking about supporting people who are doing good things! For instance, my blogging buddy, Dr. Beth Brombosz, recently published a print and digital book, called “Blogger to Author,” and she was kind enough to send me a copy for review. You may remember that I mentioned Beth before, because she hosted me on her podcast of the same name, Blogger to Author, and you can listen to my episode here. Well, Beth’s book is exactly like it sounds. It’s a step-by-step guide offering insight on how a blogger can turn content that they’ve already developed into a book — either a digital book or a hard-copy book. 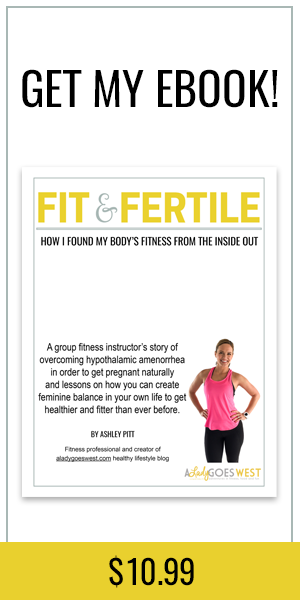 I wish Beth’s book had been available when I was working on writing my first ebook, “Fit and Fertile,” because it would have been super helpful to guide me along. But even though my book has been released (did you buy it yet? I hope you will! ), I still got a lot out of Beth’s tutorial. She breaks down how to find the right topics to write about based on what you’ve been covering on your blog, how to test the idea with your audience, how to market your idea and also how to actually get the words to turn into a book, which you can sell yourself or sell on other sites for more exposure, like Amazon. (By the way, Beth recently helped me get my book for sale on Amazon, woohoo!). She also talks about the growing popularity of self-publishing and its pros and cons compared to working with a traditional publisher. It’s a quick read, broken into chapters, so you can go back and find exactly what you need as you move along in the development and writing process. 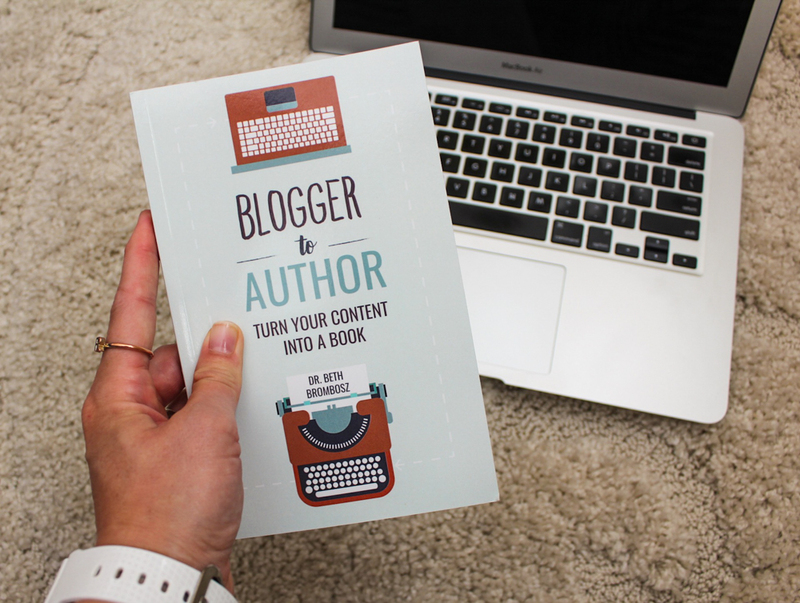 If you’re a blogger or someone who is interested in writing a book one day, I would highly recommend “Blogger to Author,” so check it out here. And Beth was so kind as to offer TWO hard copies for giving away on the blog today. To enter, all you have to do is leave a comment on this blog post, and I’ll choose two winners on Wednesday of next week. Thanks, Dr. Beth! In addition to the taste, Alter Eco Foods is another eco-friendly company (I’m on a roll today with supporting awesome companies and people), and these chocolates are fair-trade, non-GMO and organic and sourced from cacao beans in Ecuador and Peru, then finished off at a chocolatier in Switzerland. Yes! INSTAGRAM GIVEAWAY: In case you missed it, I’m hosting a giveaway for a sampling of Alter Eco bars and truffles over on Instagram, which will close tonight, so check it out! 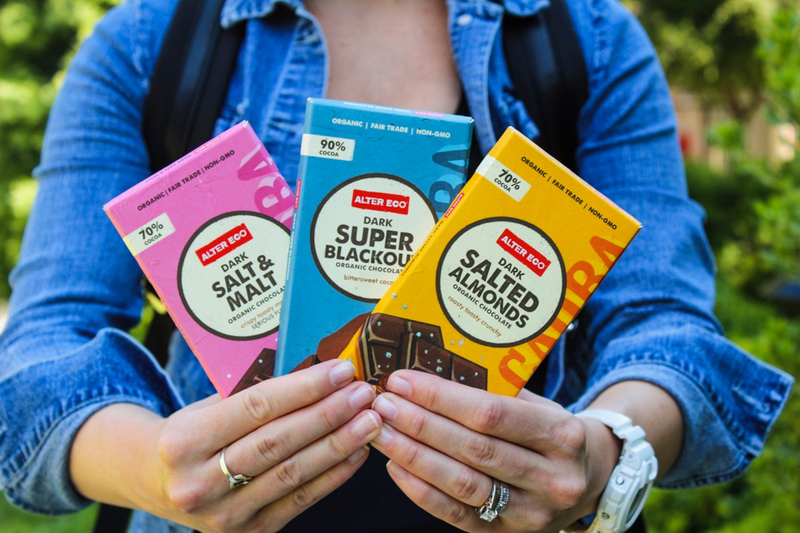 You can also find a store near you that sells the bars or shop online here, if you don’t win, or if you don’t have Instagram. There are always a few gems on MBG, and this one about boosting your metabolism is a good read for everybody. We all love to talk about Trader Joe’s. I’ve given you a list of what I love to buy there, and here’s a registered dietitian’s take on the best food to buy. Hope you have a fabulous weekend, my friends! See you soon! What’s something you’ve been loving lately? Have you ever had a pregnancy brain moment? Whether you are pregnant or not? GIVEAWAY REMINDER: If you want to win a copy of “Blogger to Author,” leave a comment on this post, and I’ll choose two winners next week. Just wait until sleep deprived forgetfulness, haha! It’s ridiculous how crazy you can be and what you can forget when you’re running on minimal sleep! That’s too funny about the burgers though! Hi Christina! hahahah! That’s pretty funny! I don’t think you need to heat up the peanut butter, but who knows what you were thinking at the time. And I’m sure distracted and tired mom brain will be even worse than the pregnancy brain thing. Can’t wait to experiene that hahah! Happy Friday, lady! Hope you have a great weekend! I LOVE Alter Eco! So delicious. As for the preggo brain, just remember that you are human, and it is only going to get worse when kids distract you. Maybe just set timers or a post it in an obvious place to remind you of things that you are scared you will forget for the time being! Yay for a book giveaway! I might as well get a head start on the info if I can! That backpack is super cute and the chocolate sounds delish. I’m for sure going to check out Alter Eco. In a sleep deprived fog I once put my keys in fridge, it took me forever to find them. That book sounds really helpful. Hope you have a great weekend! Emily @ Pizza &Pull-ups recently posted…Friday favorites! Hi Emily! ahahhah! Keys in the fridge? Bet they were frosty when you pulled them out. I’m glad I’m not alone in this — hehehe I like your story! Hope you have a clear-minded and lovely weekend, my friend! The recent college graduate in me loves the name of the middle bar “Dark Super Blackout” bad I know but what college student never drank a little too much one night. How crazy you forgot you made veggie burgers. Thank god you turned the oven off! It could’ve been worse right? Always need to look on the bright side. Hi Maureen!! hahahhah! You make me laugh. Dark Super Blackout could totally be a college phrase. But you could shorten it to an acronym — DSB — and it was bound to happen sometimes to even the best of us! I had some friends who also used the phrase “grey out” to describe a less-than-a-blackout occurrence. Ohhhh those were the days. Right now, I just want a sip of wine hahaha! Anyways — happy Friday to you, lady! Thanks for the giggle! Oh gosh, sorry to hear about pregnancy brain! That’s a pretty hilarious story, but I’m sure you were like WHAT HAPPENED AND WHY. If it makes you feel any better, I have those moments and I ain’t pregnant! Hi Carrie! heheh! Happy Friday! I’m laughing at it now, but I was definitely disturbed earlier in the week ehehe! And I’m glad to know these things happen to you too hehe. Hope you have a great weekend planned, lady! Something exciting on the agenda, I’m sure! The kitchen is such an easy place to have pregnancy brain! I scare myself constantly with things I forget about and I’m not even pregnant, UH! lol. And omg chocolate truffles are my favorite! Our candy bowls have been empty since my family visited in June, I think it’s time to restock 😉 Happy Weekend! Hi Patricia! Happy Friday! ahahha totally time to restock the candy bowls! And I’m normally NOT a scatterbrained person at all, so that’s why this whole pregnancy brain thing is alarming hahah. Oh well! Happy Friday to you, my friend! Awesome giveaway! Would love a copy. And the chocolate looks yummy! Laura recently posted…Las Vegas on Budget, Baby! Hi Laura! Yay! The chocolate is yummy, and thanks for saying hi! Hope you have a wonderful Friday and weekend! Here’s another crazy one for you to look forward to…phantom fetal movements. Yes, POST-birth you still have the sensation of baby moving inside you. It totally happened to me, and even took me a minute to look at my baby to confirm it was impossible to be feeling kicks in my belly!!! OMG Julie, I got the chills reading that. No way. So weird. hahahah! THANK YOU for letting me know this could happen hahah! Oh how pregnancy and parenting is a strange thing … 🙂 Happy Friday, lady! Hug that baby! I’m not pregnant and I’m totally doing those of kind of things ALL THE TIME. My boyfriend told me the other day it’s getting old. Tear, tear. Hopefully, you remember to eat ALL THE FOOD and this was only a one time episode. Hi Megan! hahah! Maybe you are just SO in love with the boyfriend that you can’t think straight! 🙂 hahahah! But yes, I think getting old probably does it too. Or stress. Who knows! And yes, I will be eating all the food from here on out! Happy Friday, friend! Hi Ashley, thanks for the giveaway! The book looks awesome and I’d love to read it. Thanks again and have a wonderful weekend! P.S. I have a US mailing address in case the giveaway requires that. Ohhh Diane! You TOTALLY need to write a book with all the unique content you have! Thanks for saying hi, lady! Hope you are doing well! If it makes you feel better, last week we heated up some veggies for dinner in the microwave and it wasn’t until the middle of my spin class the next morning that I realized we never actually took the food out and ate it. And I’m definitely not pregnant so at least you have an excuse! Hi Emily! hahaha OMG — that’s pretty funny and totally does make me feel better about my own distracted mess-up in the kitchen. I hope the veggies didn’t stink next day hahah Happy Friday, lady! Here’s to being self aware all weekend for the both of us! Ooooo I had Brew Dr. kombucha this week too!! 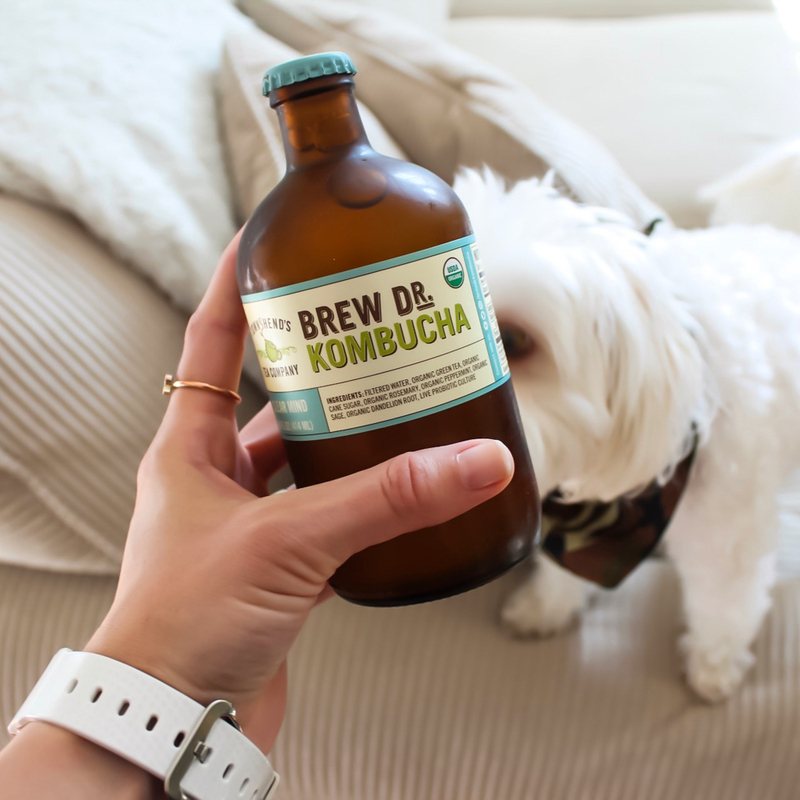 I’ve been loving kombucha lately – I usually have one every day when I get back from work, so I don’t snack before din! Man, pregnancy brain. It does get better and then there are some days….my “baby” is 21 and I still do silly things like that! I’d much rather call it pregnancy brain remnants than “lost-my-mind-itis.” LOL! That backpack is cool! I recently got a vegan leather one at TJ Maxx that’s gray and soft and fabulous. I think I need to add that fancy black one to my collection! Haven’t seen that Brew Dr. Kombucha. Wonder if I live in too small of a town to have it? Hi Jennifer! Thanks for saying hi! And YAY for vegan leather backpacks. I actually can find Brew Dr. at Target, believe it or not! 🙂 Hope you’ve been having a great weekend!